There is no historical precedent for the break-up of the eurozone. The consequences of the eurozone breaking up represent one of the great unknowns in the present economic crisis. Jens Nordvig writes that while there have been several examples of currency unions breaking apart in the past, the scale of the eurozone and its importance to the global economy would make such an event unprecedented. Even if the break-up were confined to the troubled eurozone economies of Greece, Ireland, Italy, Portugal and Spain, there would be no historical parallel. If we look back long enough, there are plenty of examples of currency unions which have broken apart. However, inference based on previous currency union dissolutions must be made with great caution. Upon closer inspection, there are a number of important differences between the situation the eurozone is facing now and the situations other currency unions on the verge of break-up faced in the past. The main problem with applying historical studies to the analysis of a eurozone break-up is that past currency union break-ups typically involve countries which had a smaller impact on global markets and economies than would the eurozone today. First, in terms of its economy and financial markets, the eurozone plays an important role globally. The eurozone nations account for roughly 20 per cent of global GDP, with GIIPS countries (Greece, Ireland, Italy, Portugal and Spain) alone accounting for 6.7 per cent of global output. In the chart below, we compare the size of the eurozone economy to the economic size of past currency unions that faced break-ups, as a percentage of world GDP at the time of break-up. Figure 1 clearly illustrates that the eurozone stands out both in terms of GDP (size of the bubble) and real GDP per capita (y-axis magnitude), accounting for an unprecedentedly large share of the global economy compared to previously disassembled currency unions. 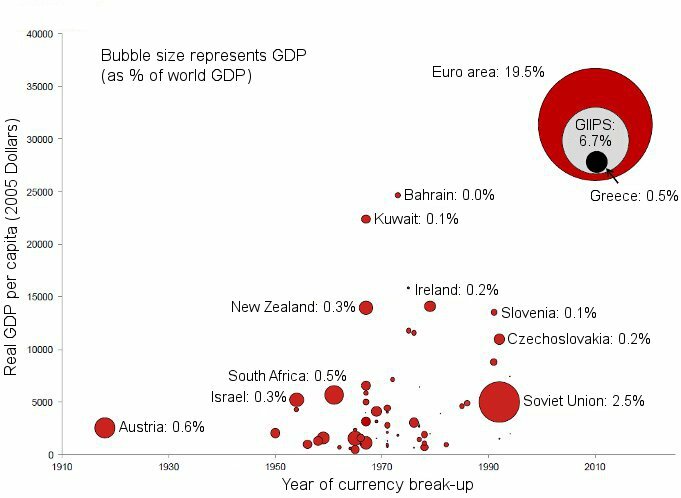 Note: Size of bubbles reflects GDP (in current US Dollars) as a share (%) of world GDP at the time of break-up. GDP per capita at the time of break-up is measured in 2005 Dollars, and we have included a full-blown eurozone break-up, a limited break-up involving only GIIPS countries, and a unilateral Greek exit in 2012 for illustrative purposes. Eurozone and Soviet Union GDP per capita are calculated as an average of values for the individual countries making up the currency unions. Due to data restrictions, Austria is the only country included from the Austro-Hungarian break-up. Economic output, however, is only one metric of the importance of the eurozone in the global economy. If we look at the size of eurozone financial markets, we will find that the relative importance of the eurozone is even greater. For example, eurozone banks account for 35 per cent of global bank assets and for 34 per cent of global cross-border lending. Conversely, the Soviet Union (which is the second largest out of G7 currency union break-ups we have studied) was not very integrated in the global financial system at the time of its currency union break-up. Note: World measure of debt market adopted from McKinsey survey based on data from Dealogic, BIS, SIFMA, S&P, and McKinsey proprietary analytics. The large size of eurozone financial markets is not only a function of the economic girth of the region but also of the very high degree of financial development in the region. One of the arguments for creating the eurozone was that it would see an integration of financial markets, leading to improved liquidity and efficiency. The real GDP per capita in the eurozone is about 5 times as high as the average observed in previous examples of currency union break-ups. Moreover, there are going to be significant differences between a break-up of the eurozone and past currency union break-ups in relation to capital mobility. This is partly due to advances in technology, which have made cross-border movement of capital extremely easy. The regulatory environment is also important, since capital movement is unrestricted within the eurozone (as stipulated in the founding treaties). In turn, new circumstances govern the risk of capital flight in this break-up scenario; staggeringly more mobile capital would force create transition costs exponentially higher than those in historical examples. Finally, we want to stress that the Euro’s role as an important international currency raises new issues associated with a break-up that have not been in play in earlier periods of currency union break-up. There are around EUR20 trillion of Euro denominated contracts in existence outside the jurisdiction of the eurozone when counting foreign law bonds, international loan agreements, and FX derivatives. All these contracts would be very hard to redenominate efficiently and fairly in a full-blown break-up scenario where the Euro ceases to exist. Before the euro came into existence, the European Currency Unit (ECU) was the unit of account in the European Union. When the euro was born in 1999, ECU obligations were re-denominated into EUR. A full-blown break-up of the eurozone would again necessitate a re-denomination process, and a new ECU would facilitate a more orderly re-denomination process for a myriad of contracts and obligations currently in EUR. We believe an ECU-2 mechanism, put in place using an EU directive would be the best way to avoid complete redenomination anarchy. But such a mechanism would hardly make the process smooth. In the absence of an efficient mechanism for speedy redenomination of international law contracts, however, a complete freeze of the global financial system is likely to follow from a full-blown break-up. A disorderly break-up process could make it difficult to continue to cooperate at the EU level, and could lead to a reversal of decades of trade integration. There is also the broader issue of the unprecedented level of indebtedness in developed market countries, including the eurozone countries. This does not mean that an understanding of historical experiences is not helpful. Many of the underlying fundamental economic theories are the same, even if key parameters are different in the context of the eurozone. But one must be cautious when analyzing the experience around past currency union break-ups. There are a number of reasons why a break-up of the eurozone entails entirely different and more complex issues than post currency union break-ups, and could create much more severe damage to the economies of member states, if not managed efficiently and thoughtfully. Note: Statistics represent values at time of break-up. This currency union break-up list contains 67 countries that experienced an exit from a currency union (1918- present), based on a list constructed by Andrew K. Rose in his study entitled Checking Out: Exits from Currency Unions (2007). 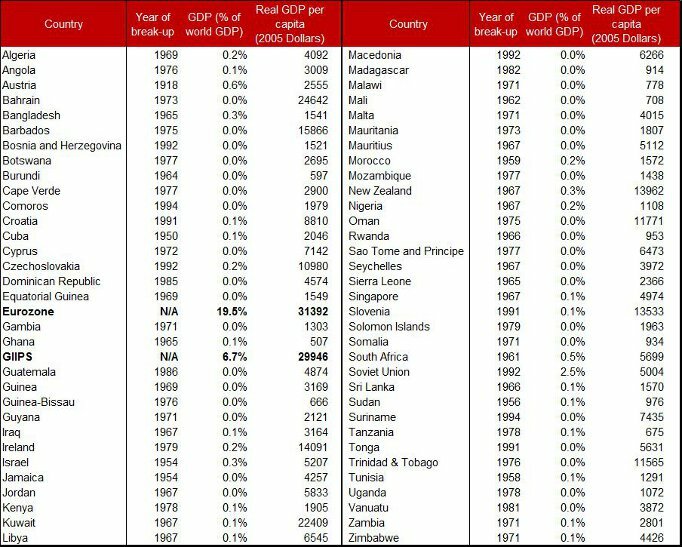 In addition to the countries in his list, we also consider the Austro-Hungarian break-up of 1918 and the Rouble-zone break-up of 1992. Eurozone aggregate figures include all 17 countries currently using the Euro as their currency. Jens Nordvig is Head of Fixed Income Research, Americas and Global Head of Foreign Exchange Strategy at the global investment bank Nomura. He has been ranked #1 in FX for two consecutive years (2011 and 2012) by Institutional Investor. Together with co-author Nick Firoozye, his submission was part of the short-list of five finalists for the Wolfson economics prize in 2012. A very informative post, thank you. I wasn’t aware there had in fact been quite so many currency union break-ups. The possibility of a break-up of the Eurozone is indeed a worrying one, and a disorderly break-up would be disastrous. But, as a small business owner trading within the EU, the current stalemate may also prove disastrous for me and no doubt plenty of similar businesses across the EU. Perhaps a fresh start, although painful at first, is both necessary and easier in the longer term. Interesting post. While you say there is no true precedent for a currency dissolution on the scale of the Euro, from what I know there is no precedent for a monetary union like the Eurozone either. We are really in uncharted waters.